SKU: FS-94-1091 Categories: USAF INSIGNIA, FIGHTER, SQUADRONS - 53-95 Tags: 1st Fighter Wing, 1st Operations Group, air superiority, capability to deploy worldwide, Hat in the Ring, homeland security operations, Joint Base Langleyâ€“Eustis, Langley AFB, Lockheed F-22 Raptor, maintain combat readiness, USAF 94th FIGHTER SQUADRON Patch, Virginia, war against terrorism. Lineage. Organized as 94 Aero Squadron on 20 Aug 1917. Redesignated as: 94 Squadron (Pursuit) on 14 Mar 1921; 94 Pursuit Squadron on 25 Jan 1923. Consolidated (8 Apr 1924) with 103 Aero Squadron which was organized on 31 Aug 1917, demobilized on 18 Aug 1919, and reconstituted. Redesignated as: 94 Pursuit Squadron (Interceptor) on 6 Dec 1939; 94 Pursuit Squadron (Fighter) on 12 Mar 1941; 94 Fighter Squadron (Twin Engine) on 15 May 1942; 94 Fighter Squadron, Two Engine, on 28 Feb 1944. 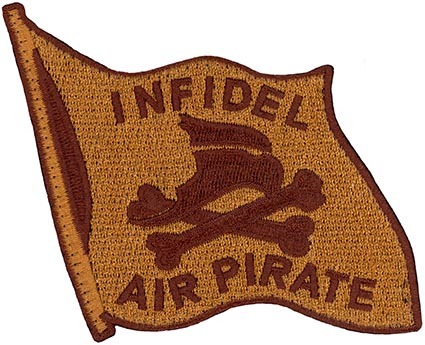 Inactivated on 16 Oct 1945. Redesignated as: 94 Fighter Squadron, Single Engine, on 5 Apr 1946; 94 Fighter Squadron, Jet Propelled, on 20 Jun 1946. Activated on 3 Jul 1946. Redesignated as: 94 Fighter Squadron, Jet, on 15 Jun 1948; 94 Fighter-Interceptor Squadron on 16 Apr 1950; 94 Tactical Fighter Squadron on 1 Jul 1971; 94 Fighter Squadron on 1 Nov 1991. Assignments. 103 Aero: Unkn, 31 Aug 1917-Jul 1918; 2 Pursuit Group, Jul 1918; 3 Pursuit Group, Aug 1918-Jan 1919. 94 Aero (later, 94 Pursuit): Unkn, 20 Aug 1917-Mar 1918; 1 Pursuit Organization and Training Center, Mar 1918; 1 Pursuit Group, 5 May-Nov 1918; Third Army, Nov 1918-Apr 1919; unkn, Apr-Aug 1919. 1 Pursuit Group, 22 Aug 1919 to consolidation. Consolidated Squadron: 1 Pursuit (later, 1 Fighter) Group, from consolidation in 1924 to 16 Oct 1945. 1 Fighter (later, 1 Fighter-Interceptor) Group, 3 Jul 1946 (attached to Alaskan Air Command, 13 Oct 1947-16 Feb 1948); 4705 Defense Wing, 6 Feb 1952; 27 Air Division, 1 Mar 1952; 1 Fighter Group, 18 Aug 1955; 1 Fighter Wing, 1 Feb 1961 (attached to 314 Air Division, c. 6 Jun-17 Nov 1969); 23 Air Division, 1 Dec 1969; 1 Tactical Fighter Wing, 1 Jul 1971; 1 Operations Group, 1 Oct 1991-. Stations. 103 Aero: Kelly Field, TX, 31 Aug 1917; Garden City, NY, 5-23 Nov 1917; Winchester, England, 8-23 Dec 1917; Issoudun, France, 24 Dec 1917; La Noblette, France, 18 Feb 1918; Bonne Maison (near Fismes), France, 10 Apr 1918; Bray Dunes, France, 2 May 1918; Leffrinckoucke, France, 5 May 1918; Crochte, France, 8 Jun 1918; Toul, France, 4 Jul 1918; Vaucouleurs, France, 7 Aug 1918; Lisle-en-Barrois, France, 20 Sep 1918; Foucaucourt, France, 6 Nov 1918; Colombey-les-Belles, France, 5 Jun 1919; Brest, France, 6-19 Feb 1919; Garden City, NY, 4-18 Mar 1919. 94 Aero (later, 94 Pursuit): Kelly Field, TX, 20 Aug 1917; Hazelhurst Field, NY, 5-27 Oct 1917; Paris, France, 18 Nov 1917; Issoudun, France, 24 Jan 1918; Villeneuve-les-Vertus, France, 5 Mar 1918; Epiez, France, 1 Apr 1918; Toul, France, 7 Apr 1918; Touquin, France, c. 30 Jun 1918; Saints, France, 9 Jul 1918; Rembercourt, France, 1 Sep 1918; Noers (near Longuyon), France, 20 Nov 1918; Coblenz, Germany, 31 Dec 1918; Colombey-les-Belles, France, 17 Apr 1919; Le Mans, France, 5-18 May 1919; Mitchel Field, NY, 1 Jun 1919; Selfridge Field, MI, 27 Jun 1919; Kelly Field, TX, c. 31 Aug 1919; Ellington Field, TX, 1 Jul 1921; Selfridge Field, MI, 1 Jul 1922 to consolidation. Consolidated Squadron: Selfridge Field, MI, from consolidation in 1924; San Diego NAS, CA, 9 Dec 1941; Long Beach, CA, 6 Feb-20 May 1942; Kirton in Lindsey, England, 10 Jun 1942; Ibsley, England, 27 Aug-24 Oct 1942; Tafaraoui, Algeria, 15 Nov 1942; Nouvion, Algeria, 21 Nov 1942; Youks-les-Bains, Algeria, 28 Nov 1942 (detachments operated from Maison Blanche, Algeria, 6-14 Dec 1942); Biskra, Tunisia, 14 Dec 1942; Chateaudun-du-Rhumel, Algeria, 14 Feb 1943; Mateur, Tunisia, c. 20 Jun 1943 (detachments operated from Dittaino, Sicily, 6-18 Sep 1943, and Gambut, Libya, 4-12 Oct 1943); Djedeida, Tunisia, c. 1 Nov 1943; Monserrato, Sardinia, 29 Nov 1943; Gioia del Colle, Italy, c. 10 Dec 1943; Salsola, Italy, Jan 1944 (detachments operated from Aghione, Corsica, 10-18 Aug 1944, and Vincenzo, Italy, 9 Jan-18 Feb 1945); Lesina, Italy, 16 Mar 1945; Marcianise, Italy, 26 Sep-16 Oct 1945. March Field (later, AFB), CA, 3 Jul 1946 (deployed at Ladd Field, AK, 13 Oct 1947-16 Feb 1948); George AFB, CA, 18 Jul 1950; Selfridge AFB, MI, 18 Aug 1955 (deployed at Osan AB, South Korea, c. 6 Jun-17 Nov 1969); Wurtsmith AFB, MI, 31 Dec 1969; MacDill AFB, FL, 1 Jul 1971; Langley AFB, VA, 30 Jun 1975-. Aircraft. 103 Aero: Spad VII, 1918; Spad XIII, 1918. 94 Aero (later, 94 Pursuit): Nieuport 28, 1918; Spad XIII, 1918-1919; 1921-1922; Fokker D-VII, Albatros D-V, Pfalz D-III, and Roland D-VI, during 1919; SE-5, 1919-1922; JN-4, JN-6, DH-4, Orenco D, and PW-5, during the period 1919 to consolidation in 1924; MB-3, 1922 to consolidation in 1924. Consolidated Squadron: MB-3, from consolidation in 1924 to 1925; PW-8, 1924-1926; P-1, 1925-1931; P-2, P-3, and P-5, 1926-1931; P-12, 1930-1932; P-6, 1932; P-16, 1932-1934; P-6, P-26, and P-30 (PB-2), 1934-1938; P-35, 1934-1941; P-36, 1938-1940; P-40 (and probably P-43), 1939-1941; P-38, 1941-1945. P-80, 1946-1949; F-86, 1949-1960; F-106, 1960-1971; F-4, 1971-1975; F-15, 1976-2005; F-22-2006-. Operations. 103 Aero: Constructed facilities, Dec 1917-1 Feb 1918; with flight echelon originally composed of former members of the Lafayette Escadrille, participated in combat as a pursuit unit with the French Fourth Army, French Sixth Army, Detachment of the Armies of the North (French), French Eighth Army, and the American First Army, 18 Feb-10 Nov 1918. 94 Aero (later, 94 Pursuit): Combat as a pursuit unit with the French Sixth Army, French Eighth Army, and the American First Army, 19 Mar-10 Nov 1918; served with the Third Army as the pursuit aviation arm of the occupation forces, Nov 1918-Apr 1919. Consolidated Squadron: Participated in gunnery practice, numerous maneuvers, and testing of aircraft, personnel, and equipment, 1921-1941. Antisubmarine operations, 9 Dec 1941-24 Mar 1942; combat in European and Mediterranean Theaters of Operation (ETO and MTO), 3 Aug 1942-4 May 1945. Air defense, Jul 1950-Jun 1971; F-4 replacement training, 1 Jul 1971-29 Jun 1975. From 1976-1992, maintained combat readiness with capability to deploy worldwide and perform all phases of assigned mission. During 1993-2005, shared rotation duties with 27 and 71 FS in support of UN peacekeeping efforts in SWA; 1994-2000, rotated to Iceland to monitor the Iceland Military Identification Zone. After 11 Sep 2001, performed homeland security operations in support of war against terrorism. Campaign Streamers. World War I: Champagne (earned by 94 Aero and 103 Aero); Lorraine (earned by 94 Aero and 103 Aero); Flanders (earned by 103 Aero); Ile-de-France (earned by 94 Aero); Champagne-Marne (earned by 94 Aero); Oise-Aisne (earned by 94 Aero); Aisne-Marne (earned by 94 Aero); St Mihiel (earned by 94 Aero and 103 Aero); Meuse-Argonne (earned by 94 Aero and 103 Aero). World War II: Antisubmarine, American Theater; Egypt-Libya; Air Offensive, Europe; Algeria-French Morocco (with Arrowhead for ground echelon only); Tunisia; Sicily; Naples-Foggia; Anzio; Rome-Arno; Normandy; Northern France; Southern France; North Apennines; Rhineland; Central Europe; Po Valley; Air Combat, EAME Theater. Southwest Asia: Southwest Asia Ceasefire. Decorations. Distinguished Unit Citations: Italy, 25 Aug 1943; Italy, 30 Aug 1943; Ploesti, Rumania, 18 May 1944. Air Force Outstanding Unit Awards: 15 Jun 1982-15 Jun 1984; 16 Jun 1984-15 Jun 1986; 1 May 1992-30 Apr 1994; 1 Jun 1995-31 May 1997; 1 Jun 1998-31 May 2000; 1 Jun 2000-31 May 2001; 1 Jun 2004-31 May 2006. French Croix de Guerre with Palm (awarded to 94th Aero); French Croix de Guerre with Two Palms (awarded to 103 Aero); French Fourragere (awarded to 103 Aero). Emblem. Approved 15 Nov 1919.